If you love RV adventures and trips then you are probably aware of how expensive it is to pack cases of water bottles. That holds true, especially if you wish to bring packs of them in your next RV adventure. 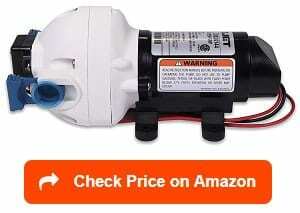 To ensure that you do not have to spend too much on water, investing in the best RV water pump is a must. This is crucial when planning to have a consistent water supply. Such water pump is actually a great item to invest in because it is capable of taking water from the tank of your RV to your rig’s pipe system. One of its main objectives is to improve the water flow while stabilizing pressure – both of which are crucial if you are traveling in an RV. Note that an average tank used for a recreational vehicle is capable of storing around 50 to 200 gallons of fresh water. With the aid of the pump, you can get the chance to consume the stored fresh water in the tank. Aside from providing pressured water, the water pump also functions by supplying a certain amount of water every minute. Most trailers make it a point to use water pumps capable of producing around 3.5-gal of water every minute. Larger trailers, on the other hand, utilize pumps designed to produce at least 5.3 gallons of water every minute. If you are still on the stage of deciding the perfect and the quietest RV fresh water pump then you are in luck as you are on your way towards gaining access to information that will let you know which one is the best. In your search for the best RV water pump, I suggest to include the Shurflo Revolution Water Pump (4008-10-E65) in your list of options. When doing a Shurflo 4008-101-E65 vs. A65 model comparison, you will instantly realize that the former costs less while still delivering a good performance. I am sure that it benefits most users because its performance is what the majority of the standard recreational vehicle requires. I think its 3-gallons per minute output is already enough for you provided you do not need to run multiple faucets simultaneously. 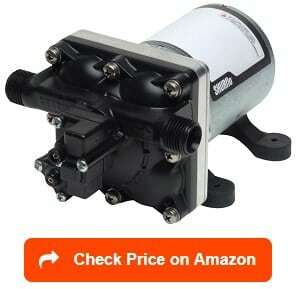 Shurflo 4008 is also a 12-volt water pump for RV with a constant speed design. In other words, it is either on or off. It is also designed in such a way that it comes with a single piece diaphragm together with an internal bypass. With such features, it can benefit users with its stunning performance and ability to last longer. It also takes pride in its high-flow demand, so expect it to operate without producing a lot of noise. One more benefit associated with this water pump is it is the use of a thermal protection, making it more capable of running dry without causing damage. Another remarkable advantage is the fact that you can easily mount it, causing ease of installation. One possible issue, though, is that it is vulnerable to leakage, so I highly advise users to take good care of it. Flojet 03526-144A is also one of your top choices if you wish to find the ideal water pump for your recreational vehicle. What I like about it is that it makes use of an automatic triplex diaphragm, allowing it to operate in a smooth manner without the need for an accumulator tank. It is because it already comes with a pulsation eliminator. Offered at an affordable price, I am pretty sure that this self-priming water pump is built to satisfy many potential users because of its ability to suction lift for a max of 9 feet. Another noticeable benefit showcased by this product is it has a soft mount capable of absorbing noise. With that in mind, there is a lower chance for it to cause annoying sounds and vibrations when the water pump operates. One more thing that I am sure anyone will like about this pump is the fact that it has a simple installation process because it already comes with snap-in, half-inch port fittings. Furthermore, it can operate safely even if it is in its dry state. Hooking it up is easy, too. One more advantage is the fact that it is constructed out of corrosion-resistant materials. With that in mind, there is a great chance for it to last longer even with the least maintenance. As for the drawbacks, one thing you will notice is that it provides weak and subpar plastic clips designed to secure the port fittings. 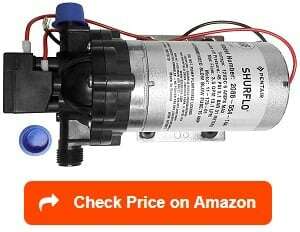 Another of the most reliable Shurflo RV water pumps that anyone can invest in is the Shurflo 2088-54-144. One benefit of this freshwater water pump that I feel is really worthwhile to highlight is the fact that it scores high as far as its water flow is concerned. It flows at a high rate while being capable of using various dispense and transfer on-demand applications. With that, I think all users will agree that this Shurflo water pump is indeed capable of showcasing an unmatched performance. Another great advantage of this pump is the fact that you can safely and easily use it to drink water and prepare food. I find it easy to install and maintain, too. It is highly durable plus guarantees its utmost reliability when using it for moderate pressure applications. Another impressive benefit is that it features a convenient and lightweight design so mounting it in any position is possible. You can mount it either horizontally or vertically. It has the capacity of supplying water to your recreational vehicle at a 3.5 gallons per minute rate and a 45 psi pressure. In addition, it is constructed out of polypropylene materials, making it safe even when the water it delivers is used for consumption. I am also happy with its ability to avoid reverse flow because of its check valve. There are drawbacks to this Shurflo freshwater pump, though, including its quite expensive price and the fact that it runs a bit noisily. Another amazing product provided by the highly reputable and reliable SHURFLO brand is the SHURFLO 4008-101-A65. It showcases an innovative design, thanks to its one-piece diaphragm, which also features an internal bypass. Regardless of your plumbing system, the pump guarantees an excellent performance for a long time. I find its ability to deliver around 3-gallons of water every minute impressive because it ensures users that it will continue to provide a sufficient water flow during emergencies. The high-flow demand that it provides also ensures that it produces the least amount of noise. The thermal protection integrated into this pump is also a big advantage because it ensures that it can run dry without causing you to worry about potential damage. I am happy with the fact that it only weighs around five lbs. With its lightweight nature, managing it is easy for me. Furthermore, it is one of the most energy-efficient water pumps designed for recreational vehicles considering the fact that it operates using 12V DC. It can, therefore, help you prevent high utility expenses. One more thing that you will surely enjoy in this water pump is its ability to prevent rapid cycling. The switches are not that sturdy, though, so there might be a need for you to replace them every few months or so. 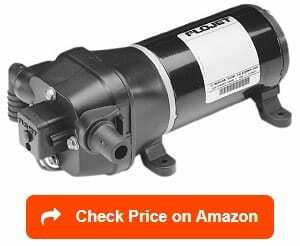 Another remarkable product that you can invest in for your RV is the Flojet 1202.1050 04406-143A Quad II. I consider this as one of the most fantastic water pumps because of its efficiency when you use it each time your RV or camper runs off of water from its storage tank. One favorable advantage I realized about this water pump is that it is capable of significantly reducing pulsating water as well as pressure switch chatter because of its bypass valve. It also delivers a sufficiently smooth flow of water – starting from 1 gallon to 3.2 gallons per minute. It is also designed in such a way that you will no longer need an accumulator tank. One more advantage is that it promotes ease in the installation process. Servicing and winterizing it is also very easy. Another reason why I am impressed with this product is that it has the ability to run and operate smoothly. I think it is mainly because it has noise-absorbent mountings as well as a pulse removing bypass. It shuts off automatically, which adds to the convenience of using it. Furthermore, it has connectors that do not leak and are easy to use because they are the quick slide-on types. It is not as quiet as other water pumps, though, especially when you use it for automotive applications. Still, you have an assurance that the produced noise is tolerable. One thing I immediately recognized and noticed in the bayite 12V DC Freshwater Pressure Diaphragm RV Pump is its versatility and flexibility. I noticed that it is flexible and versatile after I figured out that it actually has plenty of applications and uses, including for RVs, boats, campers, caravans, water taps, showers, and lawns. Another impressive benefit I love about this RV pump is its long life, which can be attributed to the precision ball bearings integrated into its motor. It can also prevent overheating as it features a thermal breaker in its interiors. It can prevent corrosion, too. This benefit is made possible by the pump’s sealed switches, which also comes with an electrocoating finish. 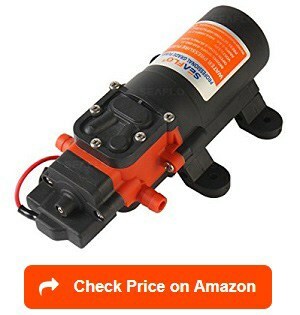 Another reason for the continuously good reviews of this freshwater RV pump is its ability to provide an adequate cushion from possible vibrations due to its soft rubber feet. I am also impressed with its performance because it runs quietly in whatever mode of operation. It also draws the least amount of current. It also cuts off automatically each time you are no longer using it because of its built-in pressure switch. This unit also boasts of its compact size, promoting ease in mounting it even on tight spaces. However, take note that it will not be able to pump a huge amount of water when you compare it to other popular RV water pumps. The amount of water pumped is not as high as other popular RV water pumps. If you want your RV to obtain the smoothest water flow, which resembles the one often provided in homes then I highly recommend the Remco 55-AQUAJET. I am glad that this water pump comes with a variable speed motor as this specific feature aids in getting rid of the on/off cycling often experienced by conventional RV water pumps. That’s what such water pumps, especially those with the conventional constant speed experiences. The variable motor also ensures that the water pump does not utilize a pressure switch just like what is used in a constant speed pump. It even gives you the opportunity of detecting certain drops in water pressure because of its pressure sensors. Once those drops are detected, the motor speed is adjusted right away, providing a constant pressure or flow of water. Another great reason why this water pump got my attention is that it operates quietly. It has a low water flow rate if you open your faucet a bit. It runs silently, too because it does not spin too fast. You can only expect it to speed up its motor each time there is an increase in water demand. It also boasts of its 5-valve design guaranteed to strengthen the water flow, thereby providing users with enough water when necessary. Lastly, it automatically shuts off, which is a big advantage. However, there are times when the water pump is incapable of working efficiently when used in low-flow situations. Another water pump that captured my attention is this specific self-priming water pump offered by Sea Fresh Marine. Offered at a reasonable price, there are numerous features and benefits that an RV user can get from it. This water pump also showcases its versatility because it is designed not only for recreational vehicles but also for marines. I find the high level of efficiency of this self-priming water pump impressive. It is powerful and efficient enough that it can deliver around 1.2 gallons of water per minute. Also, it has a highly efficient 35 psi water pressure. Expect this water pump to provide a great advantage as it has a high capacity output while boasting of a low current draw. With the self-priming design of this water pump, I am pretty sure that it can also perform what it is intended to do in a smooth and silent manner. It also has more than enough protection with the presence of its ignition and thermal overload protection. With that, it is greatly possible for it to run dry with a lower risk of damage. Aside from working well for RVs and marine applications, it is also designed in such a way that it can handle agriculture applications. Another big plus I noticed from this pump is that it turns on and off automatically through its pressure switch. It tends to cycle from time to time, though, which is why you need to install another on/off switch that you can use at night. 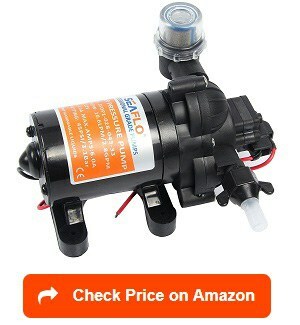 If you are looking for another budget-friendly RV water pump that still delivers what it promises to its potential users then this Seaflo RV Water Pressure Pump is definitely what I will recommend. It has a low price without compromising its features and benefits. It is a compact water pump, which, I think, is already a big advantage as it ensures that it will be easy to use. Despite being compact, it is still capable of performing a wide range of tasks, including filtration, spray, circulation, and liquid transfer. The pump is also lightweight as it is only around 1.5 lbs. One more thing that this water pressure pump takes pride in its self-priming design, which gives you the opportunity of mounting it over your tank. It also delivers utmost protection with its built-in thermal protector. Its operation is quite convenient as little noise and vibrations can be experienced in the process. It consumes less power during the process of pumping the water. It also promotes an automatic stop/start function because of the 35 psi pressure switch integrated into it. Another reason why I love this specific product from Seaflo is that it has a less demanding installation process. However, take note that the pumping capacity of this water pump is a bit lower than the other options. Lastly, I suggest including the Seaflo Water Diaphragm Self-priming RV water pump your list of choices. What is good about this specific self-priming RV water pump is that it lets you use a newer model capable of supporting the needs of your RV as well as those for agricultural purposes. With this 12-volt water pump, I am sure that you will meet all your water pumping requirements. It has a 45 psi preset pressure, providing you with a reasonable water capacity of around 2.8 gallons every minute. I also realized that it is actually constructed in such a way that it runs dry without potential damage. Another big advantage I am really impressed with is that it runs without consuming too much electricity. It is highly energy-efficient as it operates using the 12 VDC motor. I am also pleased with the fact that it has multiple fittings and thread connections that make it possible for you to connect the pump to an outlet. 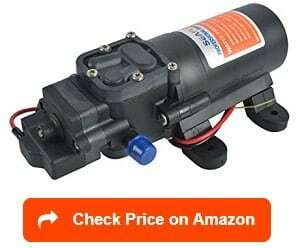 It is a protective pump, too because it has full thermal protection, which prevents the motor from overheating. Moreover, it has an automatic restart, which you can activate during malfunctions. One possible issue, though, is that it does not work as silently as the other water pumps currently introduced to RV owners. Ease of installation – One thing that will immediately tell you about the effectiveness of a particular water pump is its ease of installation. 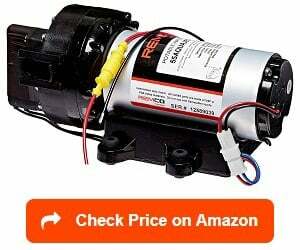 The pump should be easy and quick to install in the sense that it is easy for you to do the installation yourself. Also, ensure that the pump’s dimensions are the same as the one you are replacing. If possible, go for small-sized and compact RV water pumps because many noticed how easy it is to install them. These small pumps only have minimal usable parts in the sense that it won’t take a lot of your time. They are also lightweight plus easy to transport to the specific spot you intend to install them. Make sure, however, that you have all the materials and supplies needed for the installation, including a water hose, Teflon tape, and screwdriver. Noise level – Water pumps tend to produce some noise when it operates because of the motors incorporated into them. That’s the reason why you have to assess the noise level of the water pump you are eyeing to buy before investing your money in it. Your goal is to find a quiet RV water pump, which won’t produce too much noise even if you open several faucets simultaneously. In this case, you can go for one with a 5-chamber design, as it is known for keeping the noise produced to a minimum. Check the type of mounting used in the pump, too. It is because some mounting systems today are capable of absorbing noise. Also, beware of pumps that have jerky motors when they operate because they tend to deliver irregular water flow accompanied by noise. To ensure that you get a quiet pump, conduct a research about the background of manufacturers. Go for a brand, which already gained a reputation for manufacturing water pumps that operate quietly. GPM – GPM stands for gallons per minute. It refers to the number of gallons per minute needed by your pump to supply into your RV. Avoid getting an extremely powerful one, though. It is because bigger pumps that work harder might cause them to draw too much power from your RV’s batteries. A large one might also drain the electric system of your vehicle. You can choose smaller water pumps that are as effective as the bigger models. It should also draw less power as it can also lead to great savings on energy and water bills. However, ensure that even if you pick a pump with minimal power, you still make it a point to do something to minimize possible wastage. PSI – PSI actually stands for pounds per square inch. This is the water pressure recommended for your RV. You have to know the safest pressure required by your rig. One standard rule is to stick to the safe range, which is actually around 60 to 75 psi. Vertical suction lift – This factor requires you to take into consideration the specific amount of water required by your water pump in order for it to operate in an efficient manner. If you wish to pump a minimal amount of water efficiently then choose a pump with little lift. Such is another vital factor you should keep in mind and decide on depending on the specific spot where you will drain water. Size – Another important consideration is the size as well as the exact location of your present water pump. Note that in a recreational vehicle each square inch of available space should be utilized. This means that your pump may need to be tucked away in a place without or with little extra space. In case you have a tight present installation then you may be unable to upgrade to a water pump with a bigger capacity because of its large physical size. Pump cycle – This cycle often takes place each time the water pump is tapped off. It also happens occasionally when used in a bathroom. One possible cause of it is when the pump’s rate exceeds the actual water consumption. One thing you should take note of is that the pump needs to stop automatically each time a pressure drop happens. The moment it goes down its present value, it should be reactivated automatically. Energy-efficiency – Remember that when a water pump operates, it tends to consume a specific volume of electricity. With that in mind, check the energy-efficiency of the pump prior to buying. It should never cause you to spend a huge amount on your utility bills. Note, however, that you also have to assess whether the pump has enough power designed to make it supply a good water flow. What is the psi or the flow rate of the pump? The psi of an RV water pump stands for pounds per square inch. It refers to the specific water pressure recommended for your recreational vehicle. The safest average range, in this case, is around 60-75 psi. It also pays a lot to gain a full understanding of the pump’s flow rate. It refers to the amount of time spent by the water pump to pump a certain amount of motor. In most cases, this figure is measured based on gallons per minute. A camper or trailer can operate by using a water pump capable of producing around 3.5 gallons per minute. If you own a larger RV or motorhome, though, consider getting a pump that can supply at least 5.3 gallons every minute. What is an on-demand pump? An on-demand system is what’s usually used in an RV water pump. 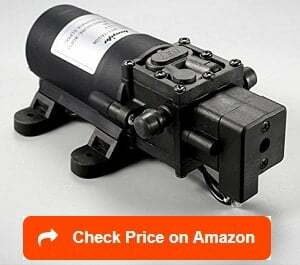 Investing in an on-demand RV water pump means that it only runs when necessary. It functions by putting pressure on the water pipe based on the preset pounds per square inch (PSI). In most cases, the pump operates at around 30 PSI but most of them are adjustable. Once you switch on the power of the pump, it begins to pump. It will continue to operate and provide the required water as long as there are faucets that are open. Once you shut off the faucet, expect the pump to continue running until the predetermined water pressure is reached. It will then turn off automatically. Such pressure will be maintained until the time a faucet is opened again. In that case, the pump will detect a drop in pressure, causing it to start pumping again. What is included in the water pump? The fittings and accessories included in a water pump vary based on the model or brand you have chosen to buy. It is mainly because while there are brands and models that already have the mentioned inclusions, there are also those that do not have them. In some cases, you will receive a straight barbed fitting along with the RV freshwater pump. Some pumps are also offered complete with all the accessories and hardware needed for their installation. Some suppliers, however, offer them separately, causing the need to invest in them separately, too. Why is my RV water pump so loud? If your water pump tends to operate so loudly then it is greatly possible that it has some issues – one of which could be a faulty design and manufacturing. Note that there are manufacturers who tend to scrimp on the cost for materials and installation. This results in compromising the water pump’s quality. The problem is that it can lead to faulty installation that might show symptoms, like loose mounts. This can lead to noise because it causes water hammer, clanging pipes, and vibrations. Another possible issue is rapid cycling. It is greatly possible for the pump to produce noise and trigger vibrations if it runs rapid cycles. To fix this issue, it would be best to make some adjustments to the cycle settings. It is also possible for the RV water pump to operate so loudly if it needs additional water storage. One sign that such storage is indeed necessary is when you are no longer capable of storing water under pressure without the pump causing vibrations. In this case, installing an accumulator compatible with the pump might be necessary. How to make an RV water pump quiet? There are actually ways for you to silence a noisy water pump. What you have to do first is turn the pump off then look for the four screws that secure it. Remove the screws. Slip a mouse pad beneath the pump then secure it again, ensuring that the screws are not overly tightened. The mouse pad is helpful in isolating the vibrations. 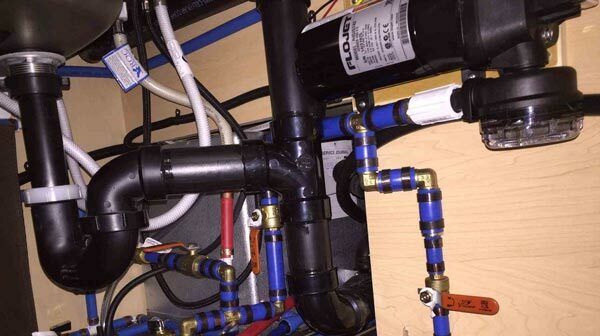 Locate the pipes that are rattling then turn on your water pump. Someone should assist you during this process as he/she needs to open and close a faucet while you are trying to find the source of rattling noise. Once you find it, use a half-inch foam insulation as a means of wrapping the rattling pipe. All the rattling pipes should be wrapped with the insulation. Also, figure out if the pump tends to cycle rapidly on and off whenever it is in a low flow condition. If this happens, pulsations in the system might happen, leading to noise. In this case, adjustments might be necessary. If the pump indeed cycles rapidly, turn the adjustment screw clockwise to raise the setting until it already runs with an off time of more than two seconds. How long should an RV water pump run? 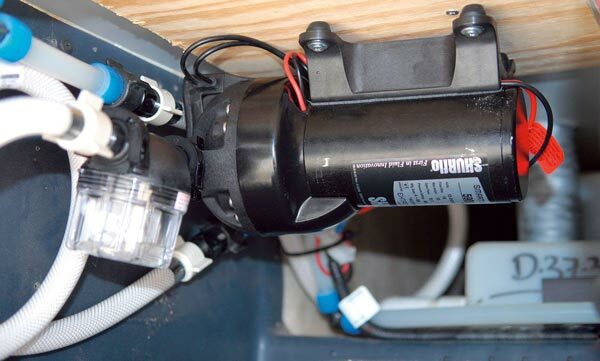 Since most RV water pumps operate using an on-demand system, it is safe to let it run and turn it on for as long as possible provided you do not connect it to city water. 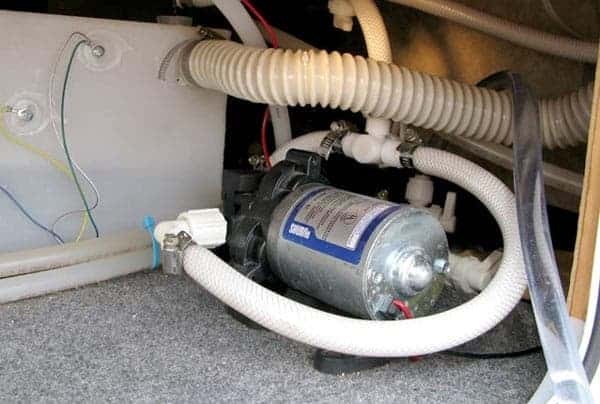 When you do not hook up to city water, your RV’s water will be pumped from the onboard holding tank. Also, take note that since it is an on-demand pump, it will only run each time you flush a toilet or turn a faucet on. A properly functioning pump will not consume power in case no demand for water is present. 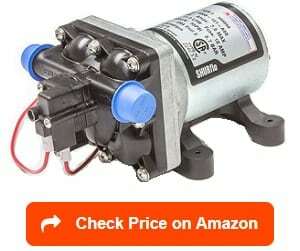 Choosing the best RV water pump should be considered as a process. That said, avoid making your choice in a rush. Make it a point to read legitimate reviews and visit forums. If possible, discuss your options with a service specialist or expert. Doing these things is crucial in making a slow yet sound and informed buying decision. We would like to thank you for reading this article. Find out more about how to choose the best RV water softeners, best RV water hoses, best RV tankless water heaters and best RV water pressure regulators with our reviews and ratings. Furthermore, please take a look at the best RV water filters and best RV shower heads, to choose the best one for your RV freshwater systems.